We are lucky to have an abundance of wildlife on our Charles Sturt University campuses, including a variety of bird life, ducks, echidnas, possums and more. While most are harmless, there are some that you should take precaution with or avoid. These animals, and how to administer first aid if attacked, are listed below. If the snake is in, or near, your building and you are worried about it - call the Division of Facilities Management's Central Point of Contact (02) 633 86336 or Campus Security on "400"
During warm weather snakes are on the move and people are reminded to take precautions. It is important that you don't panic when you see a snake - on most occasions the snake is trying to get out of the way as quickly as possible. Snakes are shy creatures and quickly scurry away at the first sign of noise (vibration) or disturbance. Usually snakes will only strike at something as a last resort and feel under threat. Most snake bites occur when people try to pick up or kill a snake. It is important to remember that snakes are protected and it is illegal to harm them. Heavy fines and even jail terms could be imposed. Snakes most commonly found in CSU campus areas are brown snakes, red-bellied black snakes, tiger snakes and copperhead snakes. CALL '000' and ask for Ambulance then call Campus Security. Kangaroos are an appealing feature of the Australian bush. As urban areas grow, more people are coming into contact with these wild, powerful and unpredictable animals. Rural and semi-urban areas provide ideal living conditions for the Eastern Grey Kangaroo. Lawns, pastures and dams are readily available food resources that encourage visitation by kangaroos. In addition, houses, other structures and garden trees providing shade encouraging kangaroos to venture into backyards. Kangaroos are often portrayed in books, films and advertising as a friendly and cuddly Australian cultural icon. However, they are wild, unpredictable animals with considerable size and power. We can admire them, but we must remember that they act on instinct and are capable of injuring people. The risk of being attacked by a kangaroo is extremely low. If you feel threatened by a kangaroo, move well clear. Do not approach it. If you need to, carefully retreat in a crouched or crawling position away from the kangaroo to a safe location or distance away from the animal. For injured animals contact the Wildlife Information and Rescue Service (WIRES). Remember, kangaroos are protected animals and it is an offence to injure or kill them. The Australian magpie is a native bird of solid medium build with distinctive black and white plumage and gold brown eyes. For most of the year magpies are fascinating and endearing native birds. However, during their breeding season from late August/ early September for around 6-8 weeks, a small percentage of birds can be aggressive, swooping at pedestrians and cyclists in defence of their nests and territory. Magpies are a protected native species in Australia. Don't fight back if a magpie swoops. Throwing sticks and stones at a magpie will likely make it more aggressive the next time anyone enters the territory around their nest. 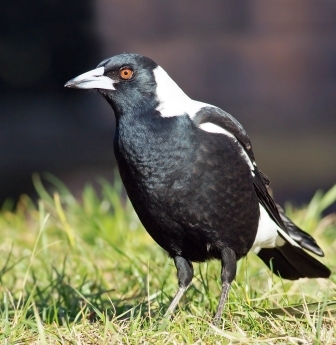 If you encounter an aggressive magpie that is interfering with your University activities, contact the Division of Facilities Management's Central Point of Contact on (02) 633 86336. Signs can be issued in the area advising pedestrians and cyclists to avoid the area or proceed with caution.